Year after year, 55 Degrees has been an integral part of our fundraising efforts. We can enjoy the peace of mind knowing that the generous donations from our community are being properly stored. The staff is professional, friendly, and well-organized. All of us at Sun and Stars Montessori School appreciate all that Karen and Neil do to support the children of St. Helena. Karen and Neil believed in Festival del Sole from its inception in 2006, and have given generously of their time, resources and talent to help in countless ways. 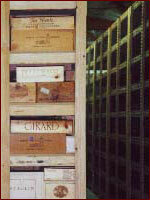 They always store the wine in perfect conditions, and cared for it as if we were their most important customer. This is the way they treat everyone: with respect, kindness and generosity. The entire team at 55 Degrees is professional, courteous, and a pleasure to interact with. Festival del Sole is proud of its association with Karen and Neil and 55 Degrees. Karen and Neil have done a masterful job in growing the annual Family House Cabernet for Connoisseurs through their leadership and attention to every detail. Without them and the Cabernet event, Family House could not increase its annual operating budget to provide temporary housing for more sick children and their families. 55 Degrees is an excellent partner to Family House. Karen and Neil have been involved with Family House for the past 10 years; Neil has been on the Family House Board of Directors for the better part of the last 9 years. They are generous and active participants who make a world of difference in our organization. The 55 Degrees staff is superb! Without the help of 55 degrees, our annual wine auction would be a nightmare. Their generosity in storing our wine gives us the flexibility to pick up over a couple of months. Everyone at 55 Degrees treats us like a "paying" customer and very helpful in all aspects of what we ask them to do for us. I definitely recommend 55 Degrees to any of our guests that purchase large amounts of wine and don't have the facilities (not year round residents) for their storage. The front office staff is very accommodating as we deal with them to get our ok to store our donations. The warehouse staff is unbelievable. Over all of the years that we have had the good fortune to be allowed to store our wine donations, we are batting 1000 in that we have never had a single bottle go missing or damaged. Karen and Neil have been great to our school and we appreciate all they do for us. Their generosity goes beyond the donation of warehouse space and we would not be as successful without the relationship between St. Helena Catholic School and Jim Ritchie and Karen and Neil. 55 degrees is known around school as our "Guardian Storage Angels." Thank you 55 Degrees. We are so grateful for the support of 55 Degrees for Nimbash, our annual fundraising auction. We rely upon them for all our pre-auction wine storage, which they handle professionally and with great care and attention to detail. I have been a customer of 55 Degrees for close to 10 years now and have nothing but great things to say about the facility and their staff. What I look for in wine storage is a company that's reliable, secure, and available when I need them and 55 Degrees exemplify those traits consistently, year after year. I have 100% complete satisfaction with their service. There has never been a single hiccup in my inventory. 55 Degrees have been flawless. I would never trust anyone else to handle my account. And, in addition, I have had access to wines through their offerings that I would not normally have had access to. The online inventory system has every feature I would want or could think of. The guys in the warehouse are very professional and treat your wine like it was their own. One of my bottles that had come in from a winery had a chip in it so they were sent it back to get me a new one, personally I never would have even thought of doing that. I have only used 55 Degrees for 3 years but now couldn't imagine using anyone else. "To say Karen & Neil, through 55 Degrees, are the gateway to Napa/Sonoma and that they represent all that is great about the wine industry is a huge understatement. I originally met Neil over a decade ago at a Napa Valley wine auction/fund raiser. We became fast friends long before I knew he and Karen provide THE wine storage solution. As an avid consumer of all that is produced from grapes and based on my KY residency, 55 Degrees has introduced me to new wines. The professionalism of 55 Degrees is overshadowed by one thing only--the friendships I have developed in knowing them over the years." Neil, Karen and their team at 55 Degrees provide outstanding professional wine storage. I know my collection is in safe hands and is being maintained in an optimal environment. 55 Degrees gets to know their clients and their needs. As well as helping you discover the latest under-the-radar rising star label. Over time you will find they become more than a vendor, but a good friend. As long time Napa Valley wine industry producers, we cannot say enough about the professional services offered by 55 Degrees, the Aldoroty family and their staff. A large number of our high end clientele rely on 55 Degrees to manage their wine storage and logistics needs, which is paramount to us to preserve the integrity of our wines through the supply chain to our end users. When referring new customers searching for complete wine storage services, 55 Degrees is always our first option. Neil and Karen are simply the best. No matter how big or small the request, it is always met with professionalism and speed. When I was in a jam back in May they responded in 90 minutes with 2 vans, inventoried the items to be stored AND delivered a return for us to another business. No One Better. Period.